Our state of the art 10,000 sq. ft. Jupiter research facility is located 1 mile from Jupiter Medical Center, with our Port St. Lucie site located directly adjacent to the St. Lucie Medical Center. 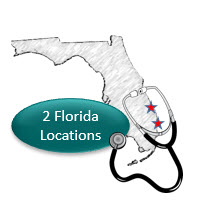 Both sites have convenient access from US-1, I-95, and Florida’s Turnpike. Please feel free to call us for personalized directions to our site at: Jupiter (561) 741-2033 or Port St. Lucie (772) 777-3344. Take exit 118 Gatlin Blvd off I95, and travel East on Gatlin Blvd. Take Gatlin Blvd for approximately 2.8 miles, and turn left onto SW Port St Lucie Blvd. Travel approximately 6 miles on Port St Lucie Blvd, turn left onto US-1 North at the traffic light. In approximately 1.3 miles, turn right onto SE Tiffany Ave at the traffic light. Turn right at the first traffic light onto SE Hillmoor Dr. Our location is ¼ mile down on your left. From US-1 South of Port St. Lucie Blvd. Take US-1 North toward St. Lucie Medical Center. Travel US-1 North approximately 1.3 miles past Port St Lucie Blvd, and turn right onto SE Tiffany Ave at the traffic light. Turn right at the first traffic light onto SE Hillmoor Dr. Our location is ¼ mile down on your left. From US-1 North of Port St. Lucie Blvd. Take US-1 South toward St. Lucie Medical Center. Travel US-1 South approximately 1.3 miles past SE Veterans Memorial Parkway, and turn left onto SE Tiffany Ave at the traffic light. Turn right at the first traffic light onto SE Hillmoor Dr. Our location is ¼ mile down on your left. Take exit 142 Port St Lucie Blvd. Turn right, and head East on Port St Lucie Blvd. Travel Port St Lucie Blvd approximately 4 miles, and turn left onto US-1 North at the traffic light. In approximately 1.3 miles, turn right at the traffic light onto SE Tiffany Ave at the traffic light. Turn right at the first traffic light onto SE Hillmoor Dr. Our location is ¼ mile down on your left. How can Health Awareness help you?